Aarur Tamil Nadan alias Amutha Tamil Nadan is the 'star' now. It is just because of a complaint he registered recently. You may wonder what is that? 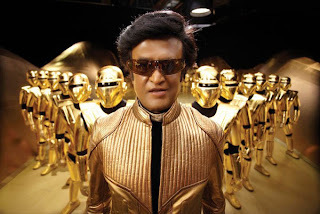 The popularity of the complaint lies in that it is raised against the block buster Rajni film 'Endhiran'. Aarur Tamil Nadan is a Tamil novelist who works with Tamil magazine ‘Nakeeran’ . He on a previous day met city police commissioner T Rajendran and lodged a complaint against the director and producer of ‘Endhiran’, saying that they had stolen the story idea from his novel ‘Jugiba’ , which he had written and published in a magazine in 1996. Aarur Tamil Nadan alias Amutha Tamil Nadan, who is a deputy news editor with ‘Nakeeran’ , came to the police commissioner’s office with his advocates G Edwig and L Sivakumar and submitted the petition. “I had written a small novel ‘Jugiba’ in a magazine called ‘Iniya Udhayam’ , in 1996. My novel was repeated in ‘Dhik Dhik Dheepika’ magazine in 2007 with my permission . Director Shankar and producer Kalanithi Maran stole the raw story from my novel and added ingredients to the movie like songs, fights and graphics. Many of my friends and relatives informed me about the movie.I have sent a legal notice to director Shankar and producer Kalanithi Maran. As I did not get any response from them, I have now approached the city police commissioner,” the complainant told reporters. He told that he have been in the literary field since his school days. M Karunanidhi and minister K Anbazhagan had endorsed his first book of poems in 1983. Later, he participated in many literary shows with famous Tamil writers like Vairamuthu , Mu Metha and Abdul Rahman. He also added that he was awarded the title ‘Kavimaamani’.